Music doesn’t always make sense. Sometimes you throw an album on, or you hear a single on the radio, and it feels like it completely came out of left field. It’s a style, or a sound you’ve never heard before. Not all experimentation is a commercial success; in fact, most of it sits on shelves at music stores across America collecting dust. But today’s band did it well, selling over two million copies. Thomas Callaway and Brian Burton met sometime around 2004 when Callaway was touring with rap group and Burton happened to be the house DJ at one of the shows. To say they hit it off right away would be an understatement, and they became friends and musical partners. They began working on tracks when they each had free time. After they had a solid handful of tracks, demos were shipped all over the UK looking for management. Turns out it wasn’t hard to find—the first company they connected with was interested. They didn’t have a band name, instead being billed by their stage names CeeLo Green and Danger Mouse respectively, but that wasn’t going to work. 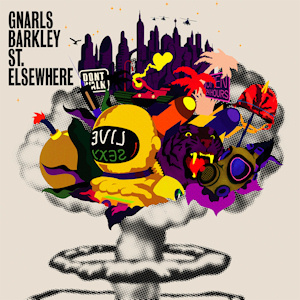 When a friend was making fun of basketball star Charles Barkley— referring to him as Gnarls Barkley, Burton wrote it down, and the rest is history. Their debut album was recorded over the course of 2005 and was released in April of 2006. St. Elsewhere almost immediately received universal acclaim and intrigue. Backed by the immense popularity of the single ‘Crazy’, the album sold over a million copies in the first year alone. The sound was something that critics couldn’t put their finger on. Some called it electronic (which was entirely too vague), others classified it as a soul album. The truth is, no one really knows—it’s music that the guys enjoy making, and it spans almost the entire musical gambit over 38 minutes. At a time where Atlanta based hip hop was really big in the U.S., here was another ATL based “hip hop” group making music, but when you put it on, you realized very quickly this wasn’t the standard. It was something no one had ever heard before. I think it took me almost a decade to really appreciate what this album accomplished. When you couldn’t go anywhere without hearing the lead single, some people grew tired of that track, and never gave the band a true chance. By the time I actually threw this album on, and really listened to it, it was probably 2012 or so, and it really blew me away. You go from gospel to alt rock to soul to R&B. It’s absolutely unique, but incredibly well done. Every time you see these guys live, they’re dressed up differently, always parodying something or someone. And I think that’s what this record is, an eccentric take on a couple guys just looking to have fun while making music. It just so happened it also turned out really, really well. Treat yourself to something different today. Toss St. Elsewhere on and see if it strikes a chord with you. I know it did for me when I bought it, and I paid way more than $5 bucks.